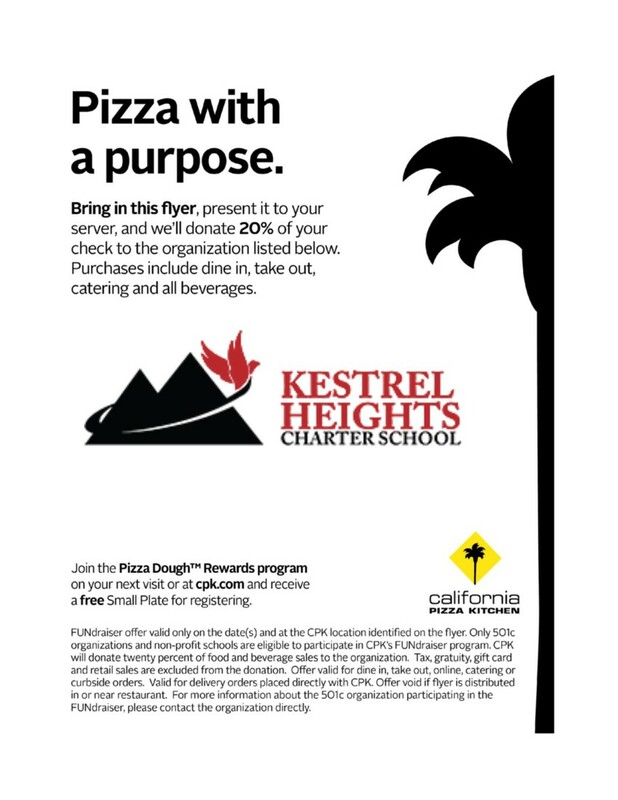 Kestrel Heights Charter School is a great option for families! You can assist our recruitment team by talking with your family, friends, church, youth or sports groups,or posting in neighborhood blogs and social media about the exciting things happening at Kestrel Heights Charter School! Refer them to our website at: www.kestrelheights.org where they can find more information, schedule a tour, and complete the online application. We will continue to accept post lottery applications for new students until the 20th day of our 2018-19 school year. Currently, we have seats available in 1st, 2nd, 7th and 8th grades. All other grades have small wait-lists. A bonus for you! Each time you refer a family to our school, and their student enrolls, you will be entered to WIN one of our $100.00 AMAZON gift cards that will be awarded at the beginning of the 2018-19 school year. Please come to check the lost and found for your child's items. All items that remain unclaimed on Thursday, March 29, will be taken to Goodwill. 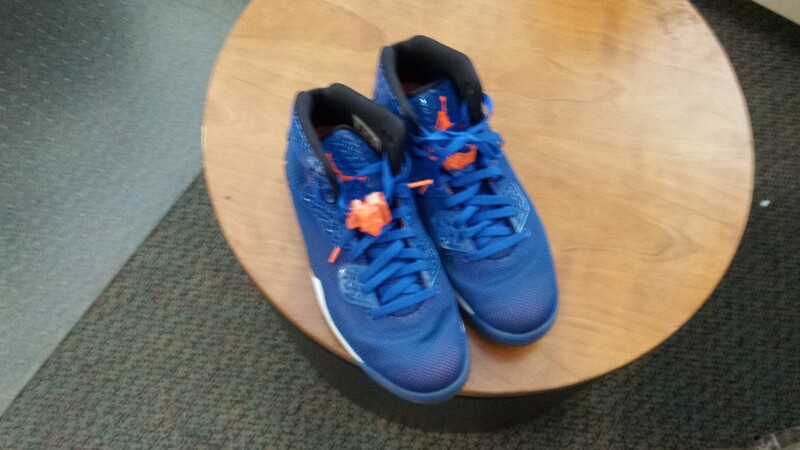 These shoes were found in the PE space. Please come to the Front Office to claim them. Parents, Teachers, Students, mark your calendars for April 14 for SPRING FEST!!! We have some really exciting activities planned including awesome rides, a dunk tank, games and booths, silent auction, performances, face painting, food trucks and more!! BUT... we can't do this without help! Please see the sign up genius link (SignUp) to sign up to volunteer. Any parent who volunteers for 2 hours will be able to purchase ride/game wristbands for $6 at the event (more than half off) for all children in their family. Teachers who volunteer for 1 slot or more will receive free ride/game wristband. Responsible students can also volunteer. New this year we will offer a discount with advanced purchase of wristbands. See attached flyer with form. Unlimited ride / games wristbands are $10 (advanced purchase) and $15 at the event! Volunteers with 2 hrs or more can purchase unlimited ride / game wristbands for $6! Teachers who volunteer for 1 slot will receive unlimited ride / game wristbands for free! We will have a Silent Auction and Performances also. We are still collecting items for the Silent Auction. We will accept donations / gift cards / etc. 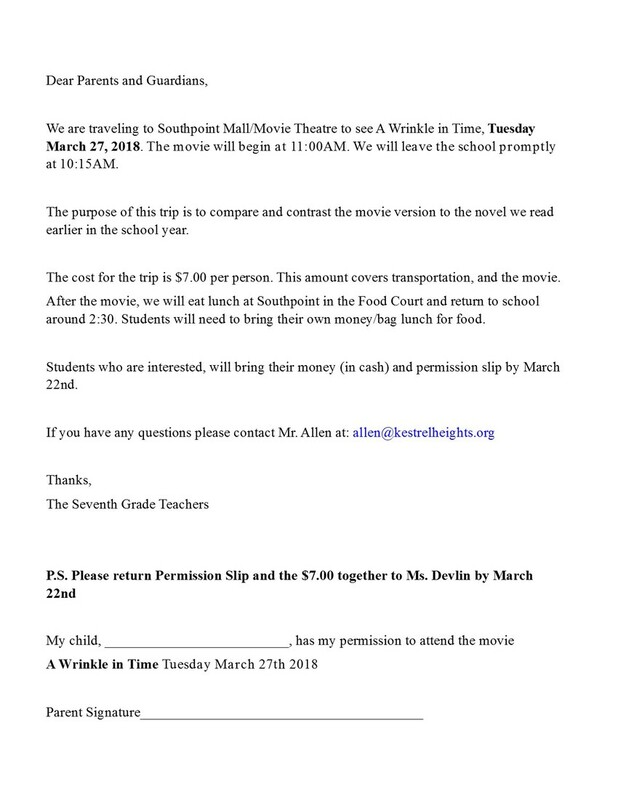 Teachers can also donate activities such as a movie or ice cream trip. Please contact Amy (kestrel.heights.ptso@gmail.com / 919-451-5798) or drop them off at the front desk. We still have a few performance spots available if you have any connections with local groups. Please contact Amy (kestrel.heights.ptso@gmail.com / 919-451-5798). Silent Auction includes Wet n’ Wild, Carolina Hurricanes, Durham Bulls, NC Symphony, Barriskill Dance, Superior Gymnastics, Frankie’s Fun Park, Cheesecake Factory, Grade Level Baskets and more! Performances by Kestrel’s Chorus, Recorder Club, Barriskill Dance and more! Want to see what rides / games will be available? Check them out below! ...and of course, a DUNK TANK to dunk your favorite teacher! ALL rides / games listed above with the exception of the Dunk Tank will be included in your wristband purchase.. for an UNLIMITED number of times! Select games and booths (including face painting) will require a separate fee to help raise money for the sponsor. See you Saturday, April 14, from 11-3 in the High School parking lot for SPRINGFEST!! Invite your neighbors, friends, and family to join us for the FUN!! 1. All students K-8 will be allowed to pre-order lunch one week prior to receiving the service. Pre-orders for the following week need to be made every Friday by 8:00 p.m. So, in order to receive a school lunch next week you mustpre-order the meal by this Friday, December 1st at 8pm. 2. Students are not allowed to charge a meal to their account. If a student does not have sufficient funds in theirlunch account a lunch will not be provided. Students will be allowed to contact parents to make lunch arrangements or to make payment to their account. 3. Any unclaimed meals will be charged to the student’s lunch account. Parents have until8am to notify the school of a student absent from school to avoid charges to account. 4. If a student with free or reduced meal status pre-orders a lunch and does not claim the lunch 6 times, the lunch benefits will be revoked. Parents/Guardians will be responsible for providing lunch. First grade had a whirlwind of a week--not even the snow could slow us down! We started a new math unit on adding and subtracting two-digit numbers, had a Paideia seminar about attitude, and discussed how animals adapt to their environment in science! Our field trip to the Museum of Life and Science is next Wednesday and we are in NEED of MORE chaperones! If you are able to come join us please contact your child's teacher right away! Second grade is preparing to end 3rd quarter with a bang and is anxiously awaiting the arrival of Spring Break! The Science fair project for 4th and 5th grade has been extended. ALL projects are due April 16th. On April 16th, 17th, and 18th, students will present to their classmates. 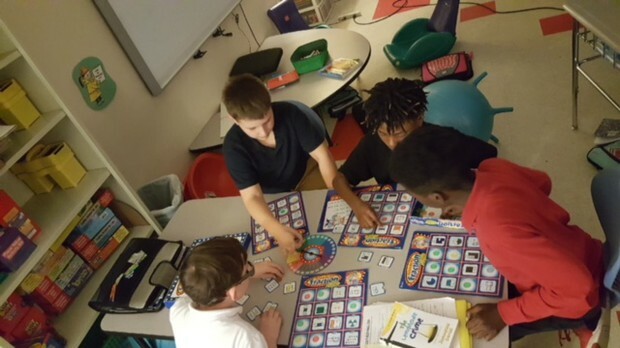 The following pictures are from Mrs. Alston's math class. Students were in math rotations that focused on fractions and their equivalent. The 5th-grade team welcomes Ms. Hudson as the long-term substitute for Ms. N'Namdi. 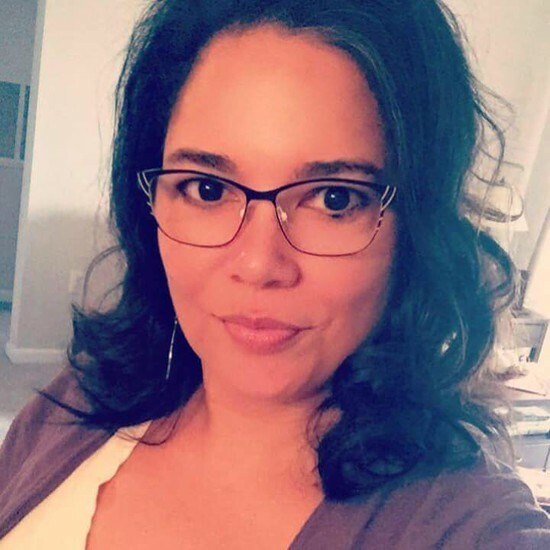 Having worked as a Kestrel substitute in various classrooms since September, Ms. Hudson comes to us certified and highly qualified to teach English with more than eight years of teaching and leadership experience in North Carolina schools. Previously a Raleigh paralegal, she earned her Bachelor of Arts degree in English and secondary education from Meredith College. A long-time Raleigh resident, while teaching in Wake County, Ms. Hudson taught many children of her own high school classmates and friends. In 2012, Ms. Hudson made the move from Raleigh to Durham for her daughter to attend Durham School of the Arts. 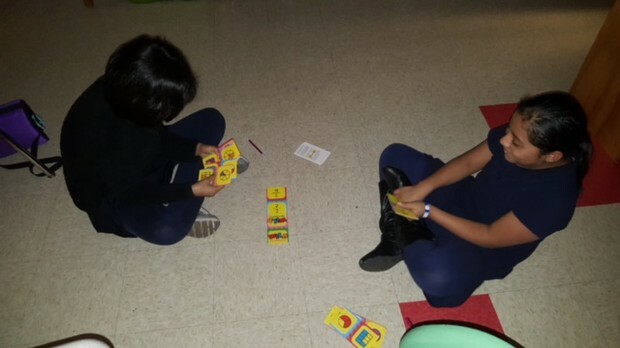 Ms. Hudson enjoys teaching 5th-graders because "they are so wide-eyed and inquisitive." 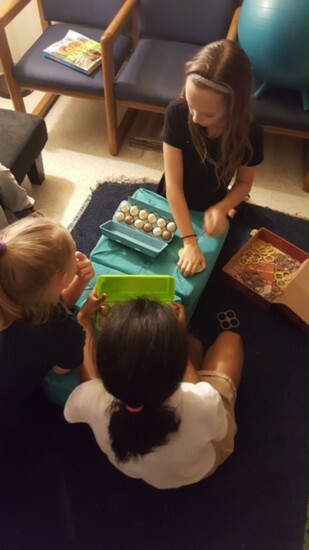 When she is not teaching, grading, planning, or doing any of the countless other tasks associated with being an educator, Ms. Hudson enjoys life with her daughter, her grown son and her grandson, Isaiah, and her pets, Snickers and KitKat. 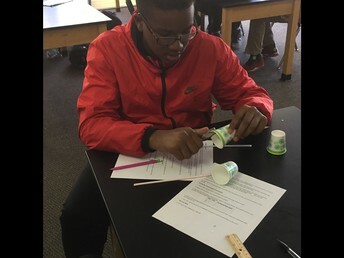 8th Grade worked on building anemometers this week to test wind speeds around our school building. Greetings from the 8th grade. Students have been working hard this quarter; however, we can not let spring fever get the best of us. As the third quarter is coming to an end and the 4th quarter is beginning, we will focus on reteaching school/class expectations.Meeting these expectations this time of year is crucial as we begin reviewing for the EOG's. Spring Fest is around the corner. The 8th grade team is donating an Arts and Crafts basket for the silent auction. Please consider donating and thank you to those who have already sent in items. The link to suggested items is below but feel free to donate anything related to the theme. All items need to be turned in before spring break so we can prepare the basket. Coach Ellis: Students in grades 6th - 8th are doing their Coached Project: YOU ARE WHAT YOU EAT! 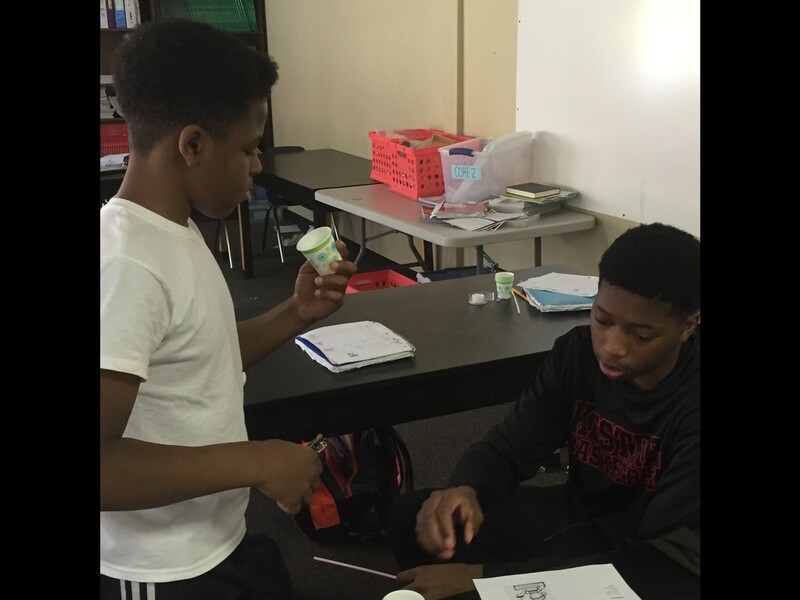 They have been reading, and tested on Chapter 8 Food & Nutrition, Chapter 9 Making Healthy Food Choices, and Chapter 10 Digestion and Excretion. Now they must take what they have learned and put it into a three page research paper. 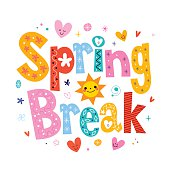 The paper is due on 3/16/18 for the 8th grade and 3/19/18 for the 6th & 7th grade. My 4th & 5th graders are in their kick ball unit along with mastering their basic exercises: Pus- Ups, Burpees, Crunches, Jumping Jacks and the Plank. They will be tested on their ability to perform these exercises next week! My kindergarten classes are playing the a game called the Robins and the Pear Trees. A great game for the little ones. Coach Hess: 1st, 2nd and 3rd grades have began their physical fitness unit with Coach Hess, non-stop body movement during these classes! We will begin to look at free videos we can use to maintain our physical fitness, even when at home. Coach Hess- Grades 1-3 have been continuing their health related physical fitness unit with a focus on ways to exercise at home. For cool fitness children videos search "Cj the workout kid" or "kids workouts with Fred" on youtube! Coach Ellis- The kindergarten students have been playing a coach Ellis original, "Starblazers" which emphasizes strategy and cardiovascular exercise. Grades 6, 7 and 8 have completed their "you are what you eat" nutrition project and have begun their track and field unit. Countdown to "SHOWTIME!" We are ONLY 5-1/2 weeks away to showtime!!!!! The Elementary Dance students are working hard and preparing for another exciting and spectacular show entitled, "It's Gotta Be Jazz!" The students are learning about the influences (in music and dance) of great Jazz musicians, such as Duke Ellington, Miles Davis, Ella Fitzgerald, John Coltrane, "Satchmo" and "Bird." I've challenged them to do a "google search" and find out more information about these artists, especially the REAL NAMES of "Satchmo" and "Bird." I'm sure they'll be surprised! The Spring Showcase will be held on Thursday, May 10, 2018. This is a REQUIRED performance, in which all students are expected to participate. If for any reason your student is unable to attend, please notify myself (Ms. Harrison - rharrison@kestrelheights.org) or Mrs. Daw (daw@kestrelheights.org), and an alternate assignment will be given. We appreciate your support and look forward to a "groovin' " performance! Performances will be in the High School Gym Annex. Students in Elementary music have listened to samples of Jazz music from different eras. We are working on vocabulary words like: Ragtime, Improvisation, Dixieland, Phonograph, Swing, and Bebop. We are learning how to enunciate consonants as we learn the lyrics to our Jazz songs. This week students are in the process of improvising with a blues scale while playing mallet instruments and recorders. Students continue to learn about the elements of music while perfecting our jazz repertoire. We have ended our session for Spring Clubs. Many thanks to all members of the staff who assisted with club offerings for the Fall and the Spring! The following clubs will still meet: Recorder Club, 4-5th Chorus, Dance Team, Ukulele Club, Guitar Club, and Art. Save the Date for 6:30, Thursday, May 17th! Kestrel will be having it's very first K-8 art show in the annex gym. Come see your child's gorgeous artwork framed. You may purchase the framed art work for $25. No pressure to buy, but all raised funds will go to our beloved Ms. N'Namdi, who is currently out on medical leave undergoing cancer treatments. We can't wait to see you then! Once again, Kramden is holding their spring Drone Flight Camp and our Game Design Lab after school program, both for grades 6-8. They have a huge amount of scholarships still available -- for Game Design Lab we have nine $265 awards and three $250 awards for Drone camp. 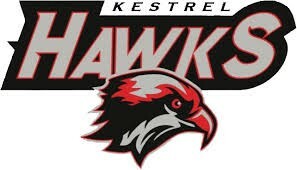 It would be great to see some of those used by Kestrel kids. The Hawks came from 5 runs down to defeat Chatham Charter 8-7 and move to 2-0 in conference, 2-1 overall. Offensive leaders were D. Higdon with 2 runs scored and 3 stolen bases, R. Bigelow with 2 hits and 3 runs batted in and B. Rose with a single and a stolen base. The Hawks next meet Voyager on Monday in non conference matchup. The Lady Hawks return to competition on Monday, they will be visiting in town rival Voyager. Hawks at Georgia Tech Swim Meet! 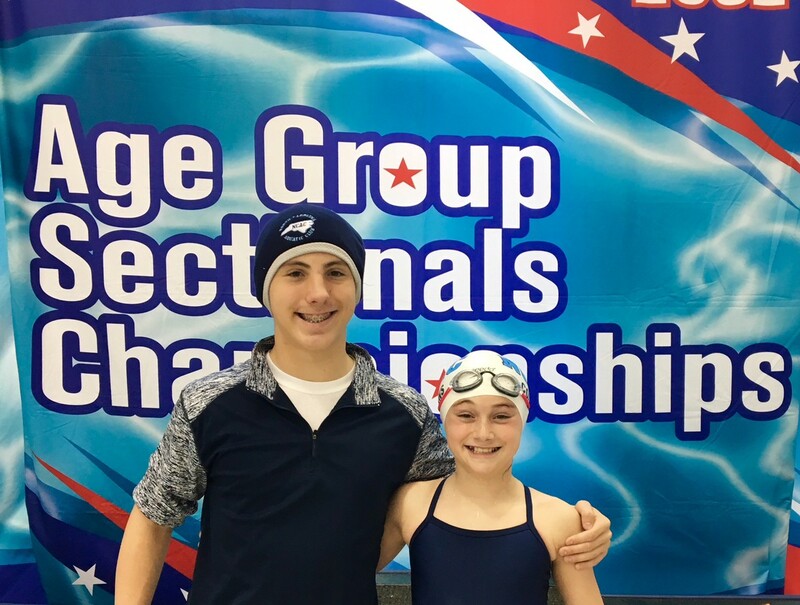 Joshua and Tink Collins competed in the Age Group Sectionals Championships March 15-18, 2018 at Georgia Tech. Swimmers qualified for the meet from seven states in the South. Joshua had personal bests in the 50 Free, 100 Free, 200 Free, 100 Fly and 200 Fly. Tink had a personal best in the 100 Back, and her medley and free relay teams both finished second. Evan Marciniak takes on the Spelling Bee! This weekend was E-X-H-I-L-A-R-A-T-I-N-G for one of our own Kestrel Heights Charter School Students. 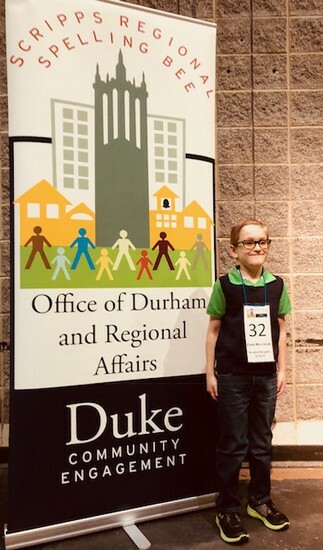 Evan M--------, one of the youngest competitors, competed in the Duke University Regional Spelling Bee held at Riverside High School in Durham on Saturday. The winner of this competition would move forward to the Scripps National Spelling Bee in Washington, D.C. Along with with spellers from Durham and Orange County schools, as well as Private, Charter and HomeSchool students, spellers were tasked in front of an audience to pronounce, repeat, and spell the words under the bright lights of the auditorium. Evan did a great job under pressure and made from a group of over 60 competitors to under 15 before being eliminated in round 7. We are so proud of you Evan!